The Ten of Cups tarot card represents the culmination of an emotional and intuitive journey. This card is not about a solitary journey, but a shared one, and the ultimate success of that journey. They have all they hoped for, and all they dreamed, and around them are all the good things in life. This Minor Arcana tarot card of the Rider Waite deck represents the ultimate in happiness and abundance. 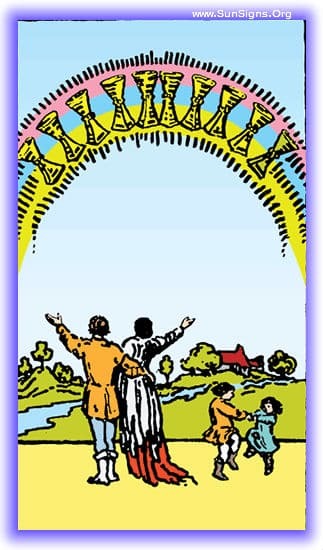 The Ten of Cups indicates that you have reached the end of your journey, and have attained all that you wished in the realm of love and contentment. It is time to stop and appreciate all that you’ve accomplished. Enjoy the harmony you’ve created around you. It may be that you have achieved a form of spiritual enlightenment, as the Suit of Water is about spirituality and intuition. Ten of Cups upright stands for harmony and happiness in relationships. You will be blessed with a quiet, serene and safe environment. You will be very lucky to receive abundant blessings. You tend to have pleasure and stability in personal relationships. Domestic harmony will help you to stay on a balanced plane emotionally. You would be able to get the respect of your own community. Friends and family would be very supportive to you. However, all this seemingly everlasting happiness and security may sometimes be an indication of being in a pothole. 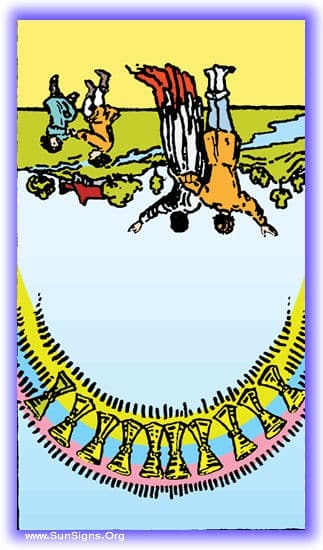 This tarot card in the past represents that you have been living in your idyllic state. The contentment you’ve been experiencing does require some maintenance, but mostly it’s a simple statement that you’ve come to the end of a long journey. It’s ok, you can rest now. You probably know this, but Ten of Cups card indicates that you may need to be told. The dreams you’ve fought so hard are there with you, and the foundation you’ve built them on are solid. Take some time to appreciate what’s come to you, you’ve earned them. With the Ten of Cups in your future, it’s a charge to you to pursue your hopes and dreams. They’re right there, but if you don’t pursue them at this critical juncture, they’re going to slip away. So go for it! Your path is clear! Yes, it is time to rest, you’ve come to the end of a long hard trial and all is as relaxed as it should be. Know that you’ve earned this. The Ten of Cups reversed indicates that your hopes and dreams are falling to your feet, there may be conflict and arguments, or just a failure to see each others point of view successfully. This can also happen when you’re compromising your own principles, and acting against your true beliefs and better judgment. Sometimes this means that you are neglecting those who are closest to you. Ten of Cups in the reversed position symbolizes impatience, family disputes, sorrow and problems at your home front. You have an antisocial streak in your behavior and may face rejection of society due to this. You often tend to play manipulative games for your own benefit. Due to severe clash of opinion and outlook, your relationships with friends may be at a risk and family quarrels are also possible. In your structured surroundings and ordered schedule, violent disturbances may crop up all of a sudden. Ten of Cups in the reversed position also sometimes stands for new births. The people you love and hold dear have been absent from your life lately, and it’s been due to things out of everyone’s control. It has been a hard and trying time, and it’s stood in the way of your relationships progression. Relationships in your life lately have not been your strong point. There has been much conflict and confusion in why things are. There has been interference with you spending time with your loved ones, either deliberately, or just circumstantial. Cherish the time you have with your loved ones now, the future is going to bring a time that interferes with your ability to be with your loved ones. It could be a situation that breeds conflict, someone could be called into service, whatever it is, it will remove your ability to bond with them until it passes. The situation as you see is not going to pass in your favor, No… Things are not easy, or over, or ready to rest. You’ve a ways to go yet.